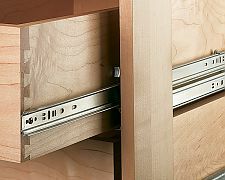 This lever release drawer slide is designed with versatility in mind. 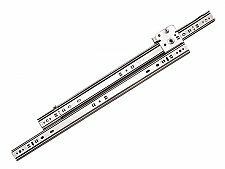 Side mounted and possessing a 3/4 extension; this slide is ideal for kitchen cabinets, bathroom vanities, desks, architectural woodwork and much more. Ball bearing nylon rollers create smooth, quiet movement and superior reliability. Recommended Use: Medium-duty slide designed for kitchen cabinet, vanity, desk and store fixture applications. Features: Mounts with pan head screws (included). Positive stop lever prevents accidental drawer removal. Lift-out disconnect.